PENCILLER: Mike Manley. Cover by Paul Renaud. DC Comics has been trying on and off to recapture some of the magic of Justice League International for the past 10 years or so. So it comes as no surprise that JLI is part of the line-up of Convergence tie-ins. It’s also no surprise that this issue doesn’t quite capture the spirit of its namesake. Still, it does manage to be a decent read. Set in pre-Zero Hour Metropolis, our Justice League must face Metallo and his batalion of “metallic men.” They must also face the harsh reality that their days may be numbered under the dome that has imprisoned the city for a year. But once the events of Convergence #1 set in, the JLI faces a new enemy: Heroes from the Kingdom Come universe. 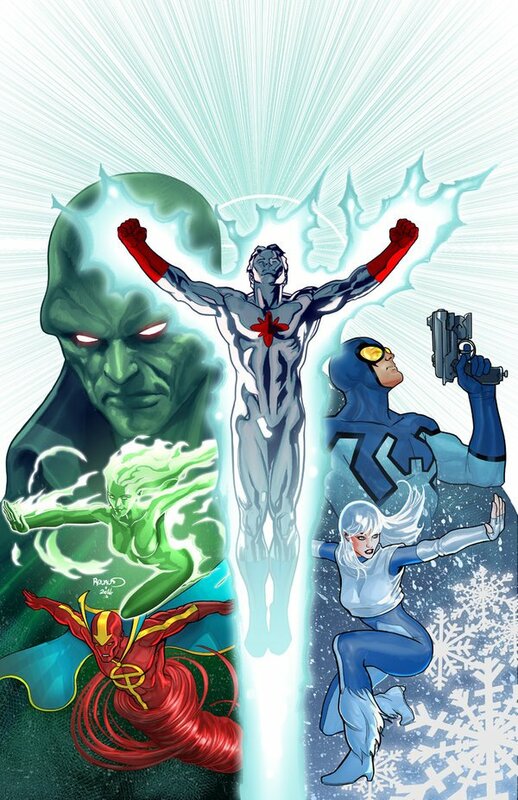 For this outing, our JLI consists of Blue Beetle (Ted Kord), Martian Manhunter, Captain Atom, Fire & Ice, and Red Tornado. Mind you, all the heroes with organic superpowers have been stripped of their abilities by the dome. In addition, much like other cities captured by Brainiac, Metropolis faces depleted resources. And even with their powers, they’ll be hard-pressed to fight the likes of Kingdom Come Wonder Woman, Shazam, etc. So the JLI find themselves in a familiar underdog position, which is a nice touch. It’s also worth noting that the Kingdom Come version of Blue Beetle is among the invaders, which means Ted could meet an alternate version of himself next issue. It’s not necessarily fair to expect the same brand of humor from this issue that was a trademark of the original JLI title. Ron Marz and Mike Manley are veterans, but to my knowledge neither of them had anything to do with JLI. So they’re in an unenviable position, as is anyone tasked with trying to recreate that lightning-in-a-bottle Keith Giffen, J.M. DeMatteis, and Kevin Maguire had in the ’80s. So one can’t be too hard on them. That being said, you’d think they’d have come up with an initial threat with a more comedic skew than Metallo. Blue Beetle has some decent lines. But certainly nothing snicker-worthy. 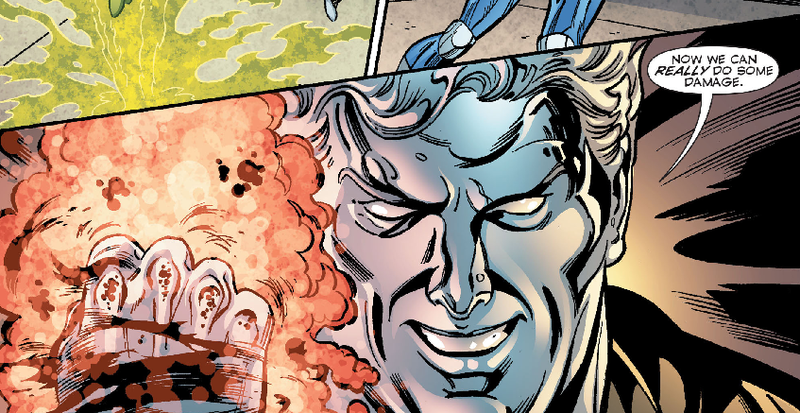 I did find myself sympathetic for Ted Kord, though. He’s been tasked with leading heroes that, without powers, are suddenly out of their element. And they’re protecting a city that’s falling apart at the seams. Marz and Manley are able to convey this during a simple scene of expository dialogue between Beetle and Manhunter, so I’ll credit them for that. Manley’s art is passable. I was by no means blown away. But as we know, he’s very much at home in a superhero story. 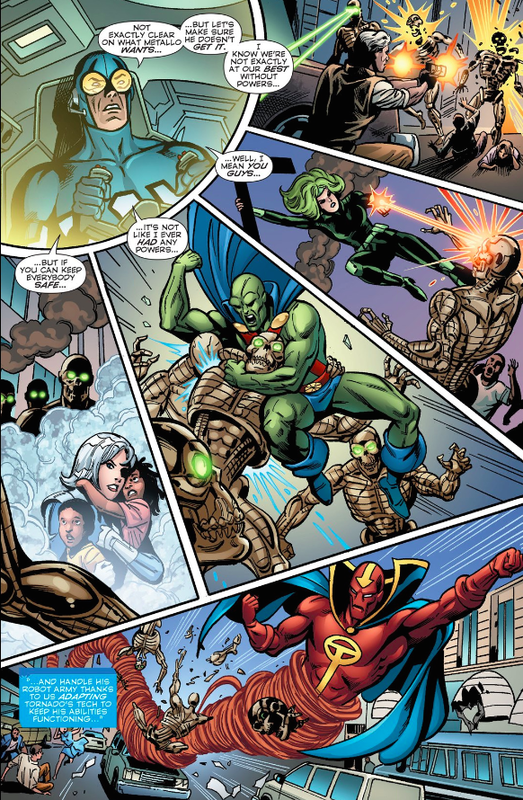 His opening pages were able to sell me on the grandeur of seeing Metallo take on the Justice League International. But as it becomes clear this isn’t the JLI we’re hoping to see, a damper is put on on the issue at large. Still, I will indeed be back for the second issue, just to see how these underdogs fare against the Kingdom Come heroes. I’m not expecting great quality, but I’m curious to see what Marz and Manley do. Image 1 from infinitecomix.com. Image 2 from splittingatomsblog.wordpress.com. This entry was posted in Comic Books/Graphic Novels and tagged Blue Beetle (Ted Kord), Captain Atom, comic book reviews, comic books, Convergence (DC Comics), Convergence: Justice League International #1, DC Comics, Fire & Ice (DC Comics), J'onn J'onzz, Justice League International, Kingdom Come, Martian Manhunter, Mike Manley, Paul Renaud, Red Tornado, Rob Siebert, Ron Marz, single issue reviews on 04/20/2015 by primaryignition.